It’s a heartbreaking reality: many women who give birth to children requiring the expert care of a neonatal intensive care unit suffer from postpartum depression and stress, and often report problems bonding with their babies – factors that can adversely affect both the short- and long-term health of both children and moms. But could something as simple as story time prove a boon to both mothers and their tiny progeny? That was the hunch of veteran neonatal nurse practitioner Susan Almarode, who is currently enrolled in the University of Virginia School of Nursing’s Doctor of Nursing Practice program. While it’s long been known that an infant benefits from exposure to its mother’s voice – a benefit seen among premature infants, too – there’s less information about reading programs as a possible salve for maternal depression and stress. So when it came time to determine a scholarly project for her DNP capstone, Almarode knew just what she wanted to study. She targeted two problems with her intervention: a lack of postpartum depression screening for these moms, who suffer from notoriously high rates of stress, and a wish to augment care providers’ ability to support them. An estimated 40 percent of mothers with babies in neonatal intensive care units suffer from postpartum depression, compared to about 12 percent of American mothers in general. Almarode’s is the first-known study to evaluate a reading program as an intervention for maternal postpartum depression and stress. With the UVA Health System’s Neonatal Intensive Care Unit-based “Reading Garden,” Almarode not only found that babies tolerated regular readings from their mothers, but that the reading also reduced moms’ rates of postpartum depression and stress, improved their perceived ability to bond with their children, and even increased the infants’ blood-oxygen saturation during reading sessions and in the 30 minutes after. Over the four weeks of Almarode’s study, 13 mothers of Neonatal Intensive Care Unit babies read to their children for at least 30 minutes, three times weekly, at a decibel level and duration appropriate to the severity of their condition. Mothers of sicker, more delicate babies – called “caterpillars” by Almarode, who developed six such descriptive categories for the babies – were read to at a whisper for brief, five-minute session, while being closely monitored for overstimulation. Heartier, older babies – who fell into the “bluebird” categories – were read to at a regular voice as tolerated. Depending on their babies’ conditions, some moms cuddled or touched their babies as they read to them. The mean gestational age of participating babies – who ranged in size from just one pound to 3.3 pounds (with a mean of 2 pounds, 6 ounces) – was 28.5 weeks, and mothers ranged in age from 20 to 42. Mothers’ and babies’ heart rates and oxygen saturation levels were assessed during three time points: 30 minutes prior to reading, during the reading and 30 minutes after each reading. Almarode found that 53.4 percent of participating moms scored high for depression prior to the reading intervention; after four weeks, however, just 15.4 percent did. 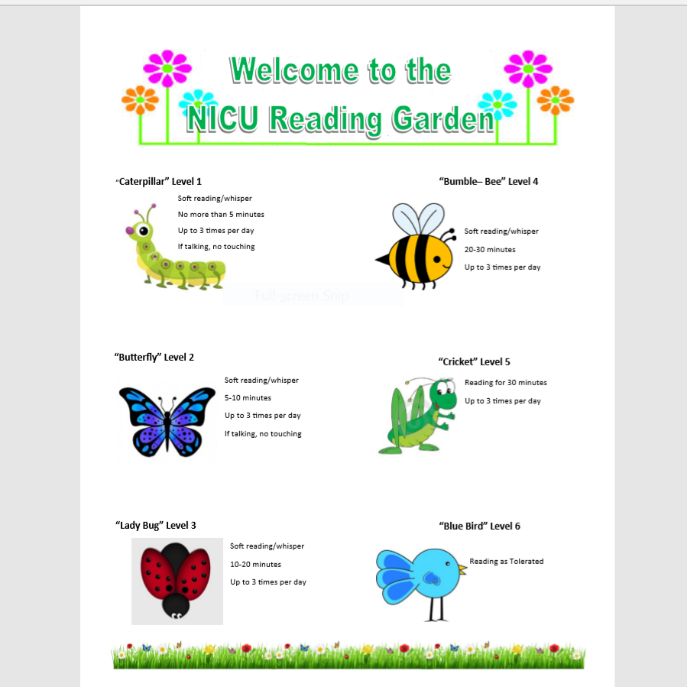 Nearly 93 percent agreed that reading made them feel closer to their babies, and 100 percent of participants said they planned to read to their babies after being discharged from the hospital. Almarode’s preliminary findings point to the need for a larger follow-up study, with a control group to solidify the science. In the short-term, however, Almarode points to the need to “reassess our current noise-reduction and deprivation strategies” in neonatal intensive care, given how well the babies tolerated being read to by their mothers, and that mothers apparently benefit from the activity. She hopes to continue moving the work forward. Books for the Reading Garden are provided by the Soho Center. The Soho Center has donated more than $10 million in quality books to children in Virginia. Through a longstanding partnership with UVA Children’s Hospital, the Soho Center gives away about 7,000 books each month to children at UVA to provide happiness and promote literacy for our youngest patients and their siblings – including in the NICU. Learn more at child2000.org/books.